The Rosen Group is pleased to announce that A Powerful Team-How CEOs and Their HR Leaders Are Transforming Organizations has just been published, and is now available for purchase on AuthorHouse, Amazon, and Barnes and Noble. 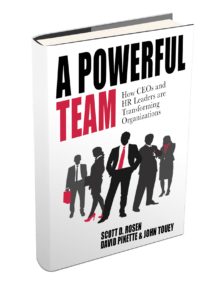 A Powerful Team, co-written by Scott Rosen, David Pinette and John Touey, shows why HR strategy matters and how it can mean the difference between organizational success and failure. Based on interviews with top CEOs and HR leaders, this book makes the compelling argument that an effective HR strategy can lead to transformative improvements in your business approach and bottom line. The advice contained herein—a collection of “best practices” on how to make the most of HR—is based on the hard-earned experience of business leaders from large, medium, and smaller companies in various industries, both public and private. For more information, or to purchase a copy, please visit AuthorHouse, Amazon, or Barnes and Noble.